1. 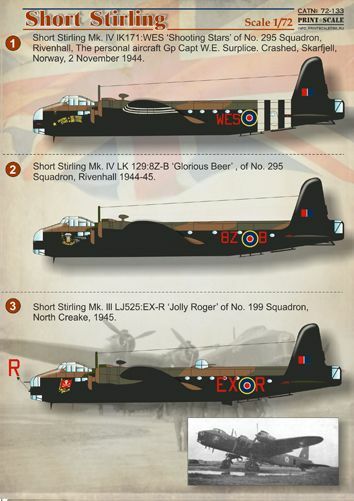 Short Stirling Mk.lV lK171:WES 'Shooting Stars' of No. 295 Squadron, Rivenhall, The personal aircraft Gp Capt W.E. Surplice. Crashed, Skarfjell, Norway, 2 November 1944. 2. Short Stirling Mk. lV LK 129:8Z-B 'Glorious Beer' , of No. 295 Squadron, Rivenhall 1944-45. 3. Short Stirling Mk. lll LJ525:EX-R 'Jolly Roger' of No. 199 Squadron, North Creake, 1945. 4. Stirling B. Mk. lll LII, VVS USSR ex Lk615. The only British bomber officially delivered to the USSR. 5. Stirling B. Mk. lll, 149 Sqn., RAF, OJ-K (Ef411), Mildenhol, United Kingdom, April 1942. 6. Stirling B. Mk.IV, 299 Sqn. RAF, 5G (Ef267) Keevil, UK, 5-6 th June 1944.